Only Georgian club to have won the Soviet Top League in former USSR times. Only Georgian club to have won a major UEFA trophy, the Cup Winners' Cup. Champions more times than any other team after independence in the early nineties. No more “evidence” is needed to “prove” that Dinamo Tbilisi have been, and continue to be, the biggest club in Georgia. 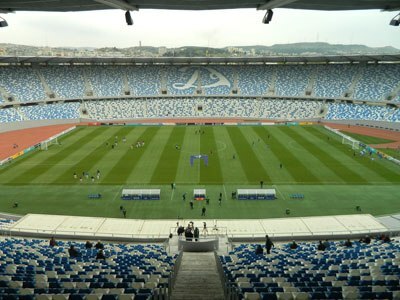 The impressive Dinamo Arena, officially named after Georgian football legend Boris Paichadze. Football Club Dinamo Tbilisi were founded in 1925 as a branch of the almighty “Dynamo Sports Society”, backed by the Soviet Ministry of Internal Affairs, and present in many cities throughout the vast USSR. As previously mentioned, Dinamo can be proud of being the only team from Georgia to have been crowned Soviet Top League champions, an incredible success, taking into consideration the fact that the league included the best teams of most Soviet Republics, with those from Russia and Ukraine practically monopolizing the titles. Their first huge success in 1964 wasn't followed up by lifting more trophies in the immediately following years, but in the late seventies the Tbilisi team took it a step further, not just winning the Top League in 1978, but also celebrating big victories in Soviet Cup finals in 1976 and 1979, winning a total of three titles in four years. The best was yet to come, if we accept that it's international success that really lifts a club to a whole different level. In May 1981, Dinamo faced Carl Zeiss Jena from East Germany in the final of the UEFA Cup Winners' Cup, having previously eliminated Greek side Kastoria, Waterford from the Republic of Ireland, famous West Ham United, and equally “big” Feyenoord. In Düsseldorf's final, despite the fact that they were left behind in the score in the 63rd minute, they “answered” in just four minutes with Vladimir Gutsaev, before Vitaly Daraselia scored in the 86th minute one of the most celebrated goals in the club's history. Next season, Dinamo came very close to repeating their "miracle". In six games against Grazer AK, Bastia, and Legia Warsawa, they had four wins and two draws, reaching so again the semifinals of the Cup Winners' Cup. There, Standard Liège proved just too good for the Georgian side, winning both games 1-0. Ever since Georgia became an independent country and started having their own national championship, Dinamo have undoubtedly been the most dominant force. They have the history, the trophies, the legendary former players and the stadium (the biggest in the country, home of the UEFA Super Cup final in 2015) to back up their title as the biggest Georgian club. Dinamo face the same problems faced by every other team in modern Georgian football, poor attendances, occasional “issues” with sectors of their fanbase, rather limited resources (enough to sustain a successful team inside the country, but not enough to make the name of the club really heard outside the borders), but that doesn't change the fact that their past is glorious, and a source of pride for everyone involved with the club. As for those “legendary former players”, it feels almost unfair to pick some, but four can be considered a step higher than the rest. The fact that the biggest stadium in the country, “Dinamo Arena”, is officially named after Boris Paichadze since 1995, gives you an idea who the most prominent figure in Dinamo's history has been. A statue of the man is standing outside the main entrance of the stadium, reminding everyone of the forward who spent his entire career at Dinamo, from 1936 to 1951, the legend who is almost unanimously considered to have been the best Georgian footballer of the 20th century. David Kipiani, a formidable attacking midfielder who played for Dinamo from 1971 to 1982 is so big in the country's football history that the Georgian Cup is named after him. Sadly, he died aged just 49, in 2001, succumbing to injuries he sustained in a car accident. Avtandil Gogoberidze wore Dinamo's jersey from 1945 to 1961, and by the time he hang up his boots he was holding both records, games played and goals scored, 344 and 128 respectively. It took almost three decades for someone to make those records his. Ramaz Shengelia first played for Dinamo in 1977. The day he played his last game, 11 years later, he was counting 350 appearances in official Dinamo games (Soviet Top League, Soviet Cup, UEFA competitions), and 151 goals, always in official matches, records that seem safe for the next... half a century. Dinamo's logo has changed numerous times through the years, especially after Georgia's independence in the early nineties. Amazing as it may seem, there were several seasons that the club opted for an emblem that did not include the extremely characteristic cursive capital “D”, the trademark of all clubs that once formed parts of the almighty “Dynamo Sports Society” in former Soviet times. The current logo has been in use since 2013, which is also when the single star was added on top of the cursive “D”.